We’ve reported on this type of rental scam for several years. It appears to be happening all over the country now. No one wants to take the blame for the housing bust in this political season, but scammers and rip-off artists in the hundreds are working overtime to siphon dollars from the wreckage of the crash and its still-vulnerable victims. Scammers in the neighborhood | CharlotteObserver.com. If you’re looking to lease a home, we suggest working with a licensed professional. Last week Gina misplaced her iPhone. Usually this would not be a huge problem but we were leaving town the next morning for several days. I had installed the “Find My iPhone” app on my phone and iPad but had not yet updated her phone. “Find My iPhone” is a “must have” application. It allows you to log into iCloud and locate your iPhone or iPad on a map. If your phone or iPad is ever lost or stolen, you can not only locate it, but the application also allows you to lock the device or delete all the data. Gina’s phone was on silent that night so calling it did not help. “Find My iPhone” will over-ride silent mode and play a tone at the highest possible volume. For some people losing their phone is an inconvenience. 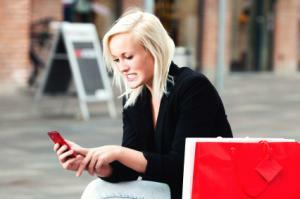 However, for many of us, our phones are a central part of our businesses. Do yourself a favor–install the free “Find My iPhone” app now. It will save you lots of time an aggravation later. We wound up leaving town without her phone but we did find it when we returned home. “Find My iPhone” is now installed on her phone as well. 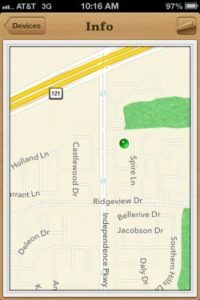 Click here to download “Find My iPhone” from iTunes. North Texas Inventory Shortage – It’s Simple Math! We’ve been talking about the lack of housing inventory for the past six months. We have a huge demand for houses and the ones on the market that are properly prepared, priced, and show-ready are under contract in a matter of weeks (in a few days below $200k). The question we get asked the most is “why” is this happening. It’s simple math! Take a look at the chart above–over the past 12 months we seen new listings rise 2 percent, yet closed sales are up over 17 percent. There’s more good news. 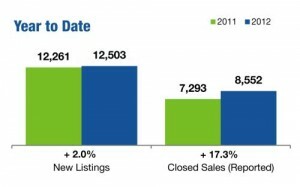 Days on Market has dropped from 95 days to 71 days and the average sales price is up 2.5 percent over last year. Even more significant is the Months of Supply which is down 36.8 percent to just 3.4 months. What’s the take-a-way for home sellers and buyers? If you are looking to sell, this is the best time in years. Selling now allows you to move up or move down taking advantage of the market condition not only in selling but also allows you to take advantage of the historic low mortgage interest rates. If you’re looking to buy, you need to move quickly. Gone are the days of searching for months and coming back to see how much prices have been reduced. Wait a few weeks and the house will be under contract. The same is true for making low offers just to see what happens. We’re seeing multiple offer situations on many houses. Looking to sell or buy a home in the North Texas area? Click here to search for homes for sale in north Texas. Contact us at 214-227-6626 if you need more information or want to work with an award-winning real estate team in the north Dallas suburbs. Phase 1 of Fall Creek is now under construction! Standard Pacific Homes is offering nine home plans ranging from 2500 to 4100 square feet with prices beginning in $340’s. There are 75 homesites in Phase 1. Fall Creek is zoned to Allen ISD with children attending Kerr Elementary, Ereckson Middle School, the Lowery Freshmen Center, and Allen High School. Fall Creek is located on Ridgeview between Exchange and Alma. This area is less than a mile from the Sam Rayburn Tollway offering easy access to fabulous shopping, entertainment and sports venues. Contact us at 214-227-6626 for more information about Fall Creek or any other new home development in the north Dallas suburbs.